Joel’s Magic Cucumbers turned out to be African Melons. Which apparently breed like rabbits. 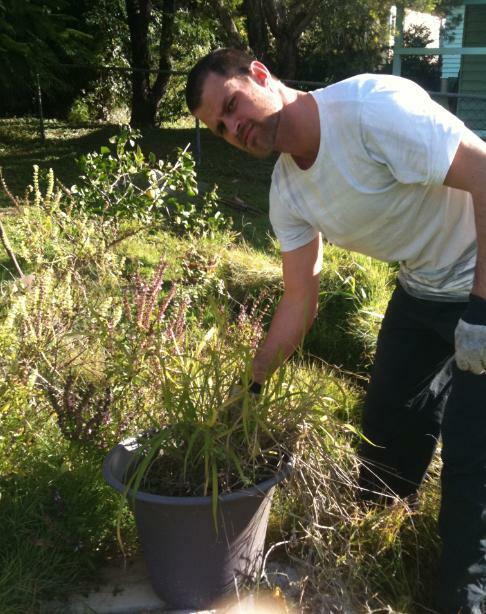 Joel tells me he didn’t even mean to plant the ‘cucumbers’. He accidentally dropped a packet of them into the veggie garden and now they’ve taken over everything. And now I HATE the African Melons. Even more than when I thought they were just angry-looking cucumbers. 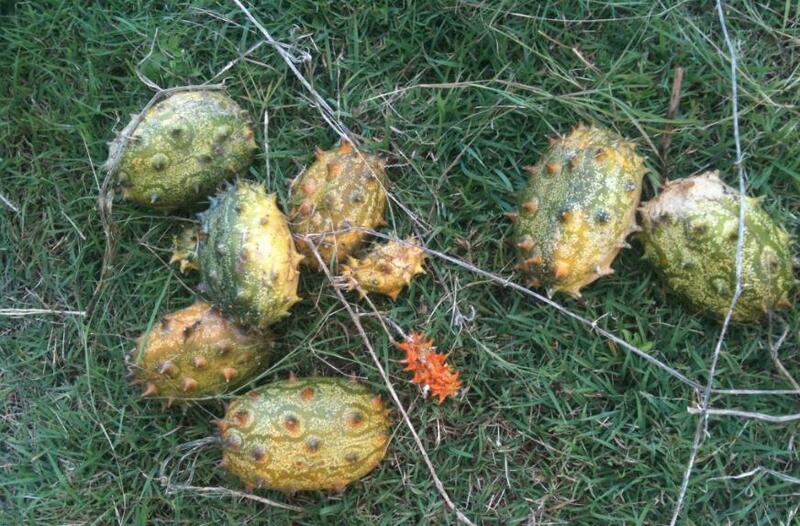 Wikipedia tells me that the fruit of the horned melon is edible, but it is more often used for decoration than for food. What you’d be decorating I do not know. Wikipedia also tells me that they taste like a combination of banana, cucumber and lemon. Which is a politically correct way of saying they taste dreadful. 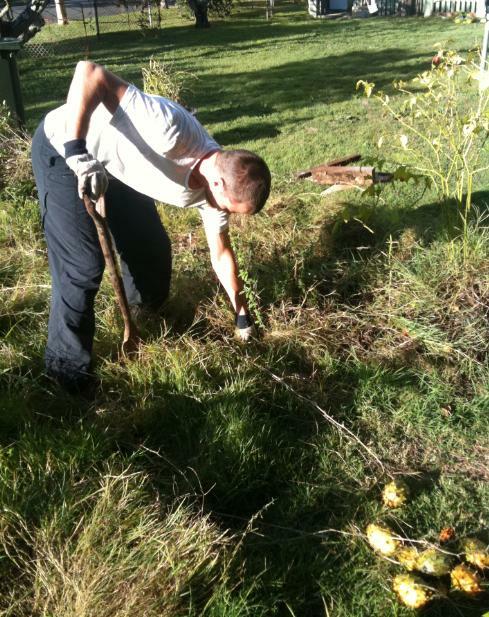 Anyway, yesterday we had a working bee to get rid of the melons. 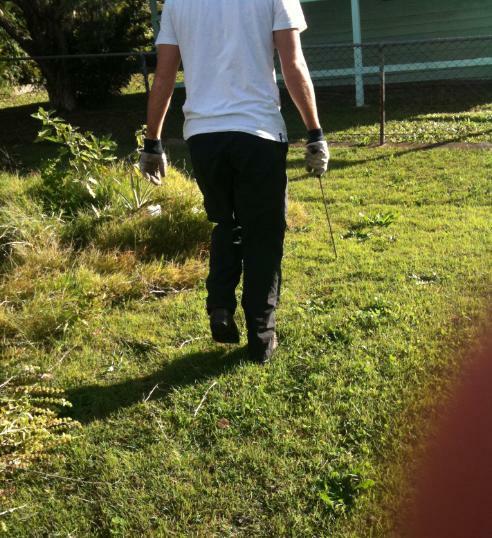 Which everyone knows means Joel had a working bee to get rid of the melons and I just followed him around taking photos. Joel: Go away, Rachel. I know what you’re doing. Me: What? I’m not doing anything. I just want to keep you company. Joel: No you don’t. You want material. Obviously, not a man who enjoys being kept company. He looks like he’s in PAIN being kept company. I stayed very quiet as I tried to think of something to say back to that truth absolute lie. I looked back, in mock-shock and told him to ignore me. Just carry on , I said. Pretend like I’m not even here. And then I took this photo of him. By the look on his face, I was starting to assume that he hated the melons just as much as I hated the melons. Or he just hated me taking photos of him. 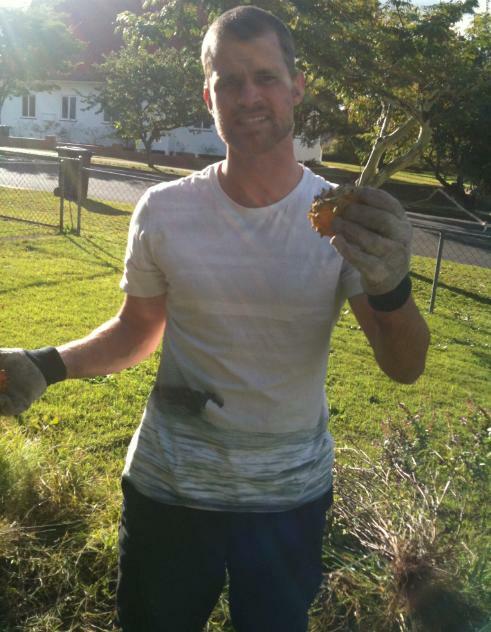 He continue to pull out the melons which had multiplied themselves all over the garden. And since he had already cottoned-on to my motives, I had no need to disguise the activities of my camera. You guys, they were everywhere. I think there must have been about 30 in total. I knew the extermination of the melons was serious when Joel brought this out. Now, friends, because photography is not one of my many talents, let me just tell you that what you see in the above picture is Joel holding in his sweet little hand a machete. 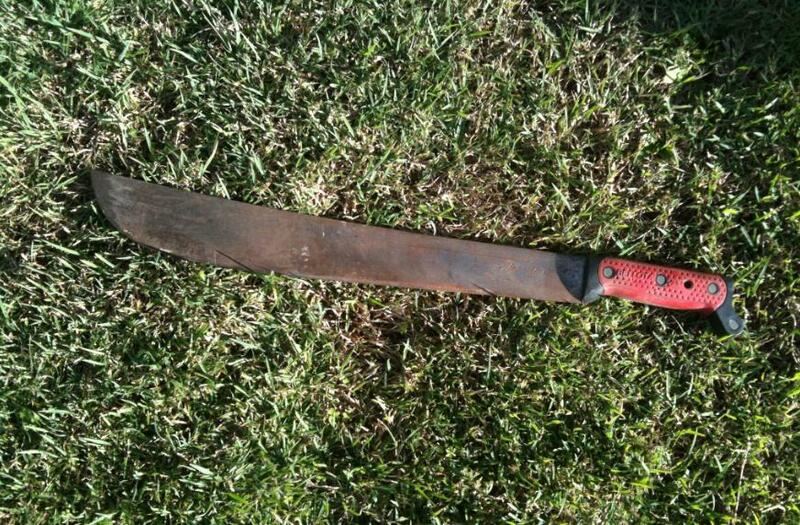 A machete like they used in the killings of the Rwandan Genocide. A machete like is traditionally used for cutting through dense rain forest scrub and sugarcane and for splitting open coconuts. So anyway, out came the machete and Joel ripped the melons off their vine and threw them into our wheely bin, one after the other. Although I hated the African Melons, it seemed like such a shame to watch them go to waste. So I talked to Joel again. Me: Why don’t you at least save some to eat? Joel: I’ve already tried them. They’re disgusting. Which, of course, I already knew because I had googled. Truth be told, I just wanted to stir him up a bit. It’s become one of my favourite things to do, Joel-stirring. So funny. I then asked him how he was possibly going to get rid of all the African Melons and stop them growing back and he said that he’ll just keep mowing over them. That’s right, friends, he’ll just keep mowing over them. Friends, I think we need to move. very very funny…..ya know, those ugglies are going to keepn back don’t ya? O yes. I’m VERY aware of that fact.